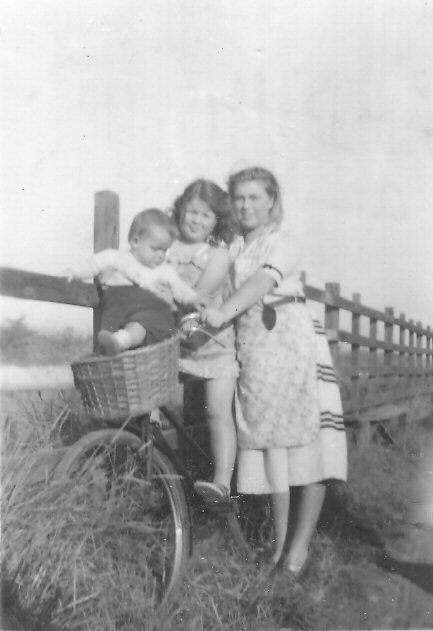 I was born in Oxfordshire in 1944 and lived in South Benfleet from 1948 to 1955. Please forgive the lack of detail as these are only the memories of a child. We first lived in a bungalow in Watlington Road where we put out a pail of salad refuse, potato peelings, etc. at the side of the road. The farmer down the street collected these to feed his pigs. We used to go to the Methodist Church for government distribution of milk powder and small bottles of concentrated orange juice. Our dad, a soldier at the time, took the train to some army base in Woolwich every day, and in late 1949 or early 1950 we moved to be closer to the train station, to a houseboat on the creek. We had to carry the drinking water a long way from the communal tap by the Canvey bridge, but we also had a cistern which collected rainwater for doing laundry. There was a washing line and a flower garden on the land adjacent to the boat. There being no electricity, we used a Tilley lamp for lighting, and a primus stove for cooking. For an oven there was a metal box with legs about 15 inches long. The primus stove went underneath and in this our mother produced the most delicious cakes, pies and roasts. The tide came in twice a day and sometimes our soup or gravy would slosh from side to side with the movement of the boat. We first lived on the “Blue Peter”. When it was destroyed in the 1953 flood, we lived temporarily on the “Windmill” until we bought the “Millie”, which was situated much closer to the Canvey bridge. As an 11 year old, I was able to carry back from the tap 2 two gallon containers of water. Both the “Blue Peter” and the “Millie” were converted barges about 70 feet long, I think. Each had a living room, a kitchen, two bedrooms and a toilet. For heat we had a little freestanding coal-burning fireplace; I remember it had two little doors with mica (?) windows. There was plenty for a child to do: we picked flowers and mushrooms in the fields, and blackberries “up” the Downs. Once when it snowed, we went tobogganing up (or would that be “down”) the Downs. We sat on the fence and waved to the engine drivers of the trains, then wrote the engine numbers down in a little notebook. We played in the marshes and walked along the sea wall toward Hadleigh Castle. In the summer we swam in the creek every day, but (for hygienic reasons) only when the tide was on the way in. We had a dinghy and a little cabin cruiser, “Evelyn II”, for family outings and picnics down the creek. Scant memories of my first year: we memorized tons of poems (“Someone came knocking at my wee, small door….”), played black castanets in the rhythm band, learned to print our letters. Each coat hook in the corridor was identified with an animal sticker. Was it Mrs. Shaw in the next class? By then we were writing little stories, doing arithmetic, and spending interminable Friday afternoons knitting a pair of striped mittens. The only other student name I remember from that class is Allen Wrigglesworth. The toilets seemed miles away down the playground. The gym equipment was stored in the air raid shelter. Across the street from the school was a little (white?) building which was the library. It was also used by my older sister’s class until the new secondary modern school was completed. Behind the school was the “Rec”, a playing field used for Field Day races. Seven to eight-year-olds were in Miss Walford’s class, where we began each day by reciting the times tables from 2 times to 13 times while she did her record keeping at her desk. On Wednesdays we would bring 6d for a National Savings stamp which we would stick in a little book which was worth 10 shillings when full. The stamp had a picture of a red squirrel holding a nut. We sat in four rows of double desks according to our ranking on the monthly tests. I don’t remember much about Mr. Seager’s class except being sent often to the office for talking too much. The caretaker would bring crates of little bottles of milk to the class just before morning playtime. Mr. Woods would come to the class once a week to drill us on mental arithmetic. He would also on occasion do music appreciation at the assembly. I particularly remember Peer Gynt “In the Hall of the Mountain King”. From that class I was supposed to go to the new school in Basildon, but we moved and I ended up at Gravesend Grammar School for Girls. To get to school from the creek we first walked along by the houseboats, then crossed the two sets of tracks (very scary for a little girl) to a footpath which lead up the Downs to the bus stop by the war memorial. Or, instead of crossing the tracks we could go down the road by the station and cross at the footbridge. We would wait on the bridge for a steam engine to pass underneath, spewing smoke all over us. On that street along and across from the station lived a woman who took in washing. Steam billowed out of her house, and sheets were always flapping on the line. Past the bus stop there was some kind of book shop. When I was quite little my mum would sometimes take me there to buy an Enid Blighton Mary Mouse book for a shilling. I learned to read from those little books– and I still have some of them. Later on I would go to that shop and buy pretty foreign stamps for my collection. Somewhere around there was a hall where we went for Brownies. We had other activities in the village too: the school choir, and fêtes in the garden at the Vicarage. I can’ t remember where it was, but I went to dance class – ballet, tap and acrobatics. I think Veronica Green took lessons too. Does anyone else remember that? I do remember coming home at night taking a creepy short cut through the churchyard. A big treat for the family was to take the train to Southend and spend a day at the Kursaal. It was also pretty cool to take the train to Pitsea market. I wonder if either of those is still in operation? Seven long ago, far away, happy childhood years in Benfleet. Just found this page. Many memories stirred. I remember the Greens……. Robin was about my age. Didn’t he emigrate to S Africa? Seem to recall some sort of connection. Rex Tyler’s post from 2016 stirred memories of the houseboats. I remember Alan Dowley too. I remember falling off the gangway onto his boat into the mud! Last I heard, probably wrongly, he’d gone to Gibraltar. My father John Taylor has many stories he tells me about his childhood with his brothers Peter and Brian. Dad now currently lives with my mum in Suffolk but I remember meeting my great granddad Thurgood when I was about 7 years old. Every time I drive past the Hoy and Helmet it makes me think of family. I and my family lived on the Houseboat Veronica in Church Creek. It was a converted landing craft and my Dad built a room on the top deck for my two brothers to sleep in as we were a family of seven.we lived on it for about seven years from 1946. My mother started the first Brownie pack in Benfleet at St Mary’s Church. Anyone remember the Green family? Jacqueline Newman nee Green. I was at Benfleet Primary in 1953 I was 9 years old, I remember Miss Cavanagh, Mr Wood, Miss Hall and Miss Harrison. During the floods we had evacuees live with us, Vic And Yvonne Vandersteen and their two boys. This post has brought back so many memories of my childhood, thank you so much. I was interested to read Peter Andrew’s comment about houseboat Hearts of Oak as my grandfather owned the thames barge Hearts of Oak in the 1930s. My mother told me that it ended its days as a houseboat on the Essex creeks. If there are photos I would love to see them. Does anyone have any memories of the Crystal Spring? I was born in 1948 and believe that I lived on the Crystal Spring for approx. 2 years. I have a vague memory of the stove that others have mentioned. I think I had a homemade cradle that swayed with the tide. We moved after a young child was killed on the train tracks as my mother was afraid for my safety. Any information would be appreciated as both my parents are deceased. If only I had asked more questions when they were alive. Long after we moved I remember my mother going to Pitsea market to buy from a vendor who was quite a character. ”I only have 10 of these, who will give me 5 bob.” All the hands shot up for the bargains, especially at Christmas. We went to Leigh on Sea and saw the cockle shacks & Chalkwell where there was a Punch & Judy show on the beach. I remember the black mud when the tide was out and how I fell in it and then had to take the train home. A trip to Southend was even more special as there were lots of shops and even tea in a fancy restaurant. How our lives have changed. Your article brought back many memories for me. My father was “Warden of the Downs” and we lived in Ray View which was the lone house in the centre of the Downs. I lived there from 1943 until 1955 when I left to do my National Service. I had a friend living on the houseboats called Alan Dowley and we were in the Sea Scouts together. All the best, Rex Tyler. My Mother Ethel, sister Maureen and brother Martin lived on a very big house boat called Evergreen during the war, having been bombed out in London. Just wondering if anyone has a memory of this vessel? My father lived on the ” hearts of oak ” houseboat. We have photographs in old family albums Of the houseboat & moorings. are they of any use to anyone ? I have tried to trace the family tree, this is another puzzle in the jigsaw ! Oh my goodness! 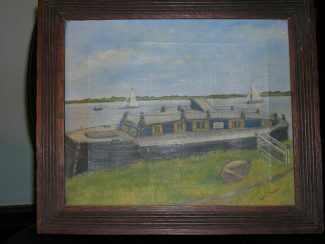 I think my Nan painted that painting… I Would recognise that signature anywhere! Wow the things you find on google when you are passing time. Pleased to see her paintings are still around as she has past on a number of years ago and would be chuffed if she knew her artwork is still floating around especially in the UK as my nan, grandfather, mum, uncle and aunties migrated to Australia. The names for the barges were of interest to me for none match the list of vessels known to have ended their days at Benfleet. Some of the old barges being used for house boats may have been moved on, however, I feel this was unlikely: most were broken up along the northern (Benfleet) shore. That is except the Henry (of Rochester) which sits on the southern side of the creek abreast of the rail station. Hearts of Oak, London, 45 net tons, blt 1879, and was 77′ in length. Broken up at Benfleet – no date. Henry, Rochester, 49 net tons, blt 1865 no further details. Hulked Benfleet Creek. Her rudder and stern post with bits of her sawn up transon can be seen sitting opposite the station. Her bottom is likely to be under the saltings. I have been over to her a couple of seasons back. Invicta, Rochester, 56 net tons, blt 1877, 77′. Broken up 1958. Mary Jane, Rochester, 42 net tons, 1877 This would have been around 77′ again. Broken up at Benfleet. Sunrise, Rochester, 50 net tons, blt 1889, 80′. House barge at Benfleet and finally broken up – no date. Details from Sailing Barge Compendium pub by Society of Sailing Barge Research. The houseboat referred to above was called ‘SEVERN’. Thanks to my cousin Tracy Stockwell for telling me, because I didn’t remember. Hi Froggy, I was a friend and never actually called you that, even behind your back! The Canvey floods are a big childhood memory for me too. I remember looking out of our kitchen window and seeing water where there was fields the day before. I still recall the shock I felt. Yes I remember the enforced holiday too at the time of the refugees. I could never quite understand why Mr Wood got some sort of ‘Honours Award’ for something enforced on the schools by the floods and the local and central government though? I remember my Uncle John and Aunty Maureen Stockwell, living in the Houseboat immediately next to the café at the bus stop turnaround area, between the station and bridge to Canvey. I used to visit them every Friday evening and stay till Saturday morning when John would take me on an outing over the Downs to look for wildlife or the marshes on Canvey to search for wild Beetroot leaves to eat. I used to leave Benfleet Primary school and go to Galloways next to the Brooke and spend my 1 and a 1/2 pence worth of Bus fare on 12 assorted fruit salad and blackjack, then walk to the creek eating them. It took me months to realise how my Aunt Maureen knew I’d done that? Then they bought a bigger mirror which I could see my black lips in. The Houseboat was actually owned by a great Aunt Lilly Hubbard, who worked first at the shirt factory, was it ‘Glanfields‘? at Tarpots then until she retired, at Hobsons on the corner of Kiln Road. Together with her sisters Ivy, May and brother Len Hubbard the night watchman, (who also worked as a steam press operator in a cleaning/laundry shop opposite the new police station in the High Street during the day) They all lived next door to us in ‘Morinville’ when we later moved from Clarence Road to The Chimes in Thundersley Park Road. Yes, Mrs Shaw taught at Benfleet Infants, together with Miss Cavanagh and later when I was there, Miss Webb. We had great times at Pitsea Market, The Kursaal, the Pier and does anyone remember the Guiness Clock by the playground on the Southend seafront too? As a further note, do you remember my cousin Peter Taylor? He would have been in the same year as you. I too remember the 1953 floods. Living in Essex Way, we saw all the Canvey Island refugees walking past our house on their way to the King John School, Thundersley, to stay. The refugees also stayed at the Primary School in the High Road so we were allowed to stay at home. I remember as a child ‘going up the Downs’, the Kursaal, Pitsea Market and every thing else you describe. I was born in 1947. We lived at 78 Essex Way (formerly No 9). Do remember my Grandfather, Harry Thurgood, the blacksmith who ran the village Smithy just above the Hoy and Helmet against the church wall? He is on this website.